In my kitchen, I treat gluten and gluten-free the same. I have quite a few gluten-free recipes on this site but it’s not because I specifically made them to be gluten-free. I made them because I liked the flavor those particular elements brought to the dish. I’m not celiac or gluten-intolerant but I still enjoy these dishes. While these grains (and seeds) get the label of “gluten-free” I think it’s important to remember that they too have a place in everyone’s kitchens. Each one is unique and can add a lot to whatever the dish may be. You may have noticed by now that I also have a certain love of crepes. While I typically enjoy the sweet variety, I do eat my fair share of savory (like this grilled cheese and asparagus crepe). I enjoy the lightness the wrap brings and how well it can lend itself to both savory and sweet. There’s a nice almond crepe in the book but I felt like sharing this easy oat crepe. If you saw yesterday’s post on grinding equipment, you may notice that you can make oat flour from rolled oats in a food processor + a little sifting. If I’m not careful, I’ll just lather these oat crepes with a bit of butter/honey and eat them just like that. Whisk together flour, salt, eggs honey, milk, and melted butter until smooth. Heat 8″ skillet and lightly grease with oil. Place a scant ¼ cup of batter in pan. Tilt the pan so that the batter covers the entire pan and cook for about 30-45 seconds. Flip and cook for another 15 seconds. Layer done crepes, slightly overlapping, on a plate. Spread 1/2 ounce goat cheese on crepe, layer 2-3 tomatoes over cheese and sprinkle with basil. Fold crepe in half and return to skillet and cook on each side until crepes are lightly browning on each side. I love sweet creeps with strawberries and whipped cream! Although I will eat any crepe…. my favorite crepe filling is a sauteed mix of spinach, corn, swiss cheese, and chicken (baked, cubed or shredded works)! My favorite crepe filling is mushrooms, spinach & cheese! These look amazing!! I am not gluten free by any stretch of the imagination, but I will try these with oat flour, I’m sure they taste great! Crepes with maple syrup + strawberries used to be my go-to Sunday morning breakfast 🙂 Definitely need to try with oat flour! I love filling sweet crepes with yogurt, cinnamon and crunchy granola with pepitas! I love a classic – strawberries and chocolate! I’d fill these crepes with peanut butter, bananas, and chocolate. Yum! These look tasty. It may be time for me to take a shot at making crepes!! Oh …. and I’m a savory fan so some kind of soft cheese and greens! I love this idea! I’m always looking for a crepe/pancake GF recipe that’s not super high in sugar or calories! This is DEF one to try! There’s really nothing to it! It’s all about the balance of flour and liquids. The almond crepes from the book are my favorite dessert crepe! I’m so unoriginal and have to say nutella and banana! I love raspberry preserves and nutella! Smoked blue cheese,mushrooms, sun dried tomato, and garlic spinach. I love your blog and recipes and look forward to buying your book. Everything I’ve seen about it so far looks fantastic! I would fill these with mushrooms and harissa! They look beautiful and moist. Yum, these really look good-definitely will try it. I like the other suggestions from the comments too. I’m a simple gal when it comes to crepes. Sugar, a squeeze of lemon and some melted butter, and I’m good to go! My favorite crepe filling is good dark chocolate and fresh strawberries. I love savoury breakfasts and this one looks so simple and beautiful. Oat crepes taste delicious and especially because they’re a little more filling, since crepes can be super light sometimes! Savory: maybe some sauteed zucchini/onion/mushroom mixture also with goat cheese. Sweet: lemon curd! nutella! I rarely see this filling at fancy crepe places – but I love peanut butter and jelly. I love mine filled with roasted veggies. My choice of filling would be peanut butter with curry leaf powder (Indian, can be found in grocery stores) / chutney or chicken curry or mixed vegetable curry. This is how we do crepes in our household and nobody in the family has a sweet tooth because we are not used to it. I love bananas in a crepe… but the goat cheese in this one has me very intrigued! for savory crepes, this sounds like a new favorite filling. although, for sweet crepes dark chocolate and raspberries never fails! I love crepes filled with nutella and strawberries! Tried this recipe and it is my new favorite! Buckwheat crepes with salmon & greens. I love simple berries (Boring, I know) but I once did an awesome portobello mushroom and goat cheese crepe. Fresh herbs would have taken it to the next level! I’ll have to try this recipe. 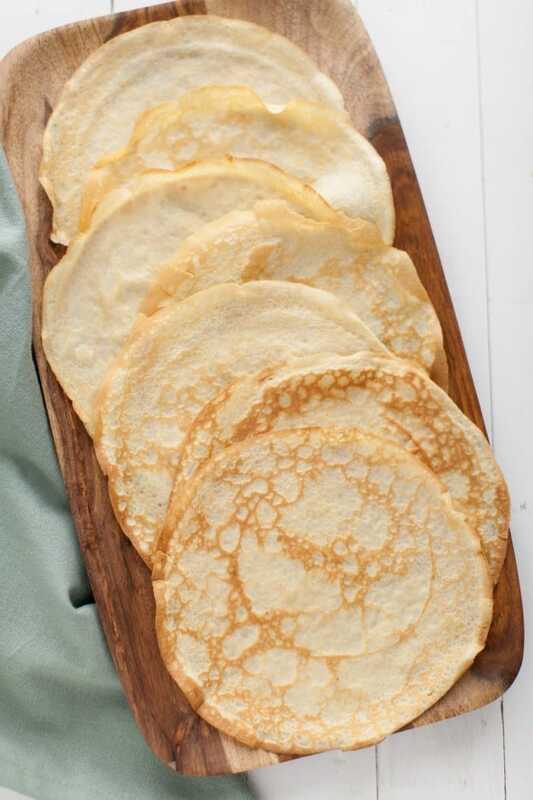 Shouldn’t these oat crepes look darker/greyish, because of the oat flour? Hi Natasha, not sure why they would be! Oat flour is fairly light and closely resembles the color of wheat flour. Wow, what a crazy giveaway! Veggies sautéed in coconut oil. i recently went gluten free for dietary reasons, and i’ve been loving all your gluten free recipes recently! i’m definitely going to have to get a copy of your book. a younger (less healthy) version of myself loved to pile whipped cream, chocolate sauce, & colorful sprinkles in my crepes. now i’m more of a savory crepe fan, and the basil + tomato combo is always a winner. i bet these would be great with a balsamic reduction too! These crepes are such a great idea! 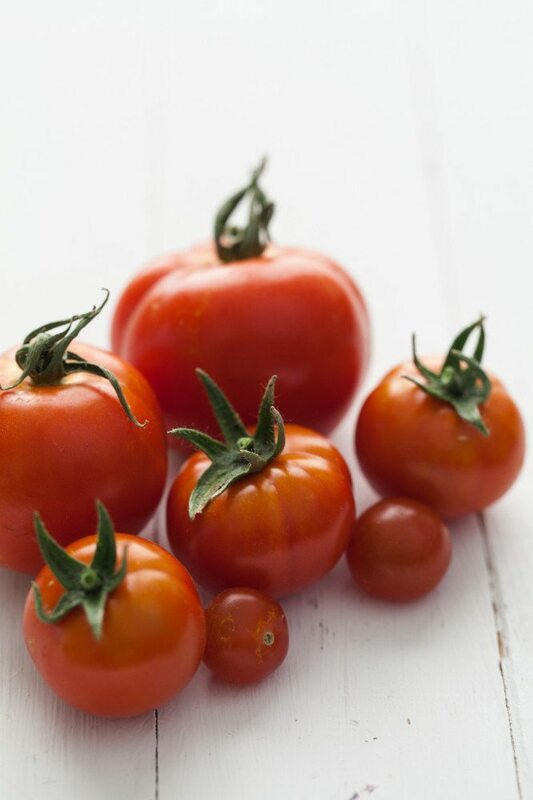 What an amazing and simple lunch–especially when the summer tomatoes ripen. I love all kinds of different crepe fillings, but I think my favorites have scrambled egg and veg. Egg and spinach is especially classic. Thanks for the giveaway opportunity! My favorite fillings are cream cheese and chocolate! lemon, ricotta cheese, radishes, and a whole lot of fresh herbs from the garden. I think that would be delicious along side a salad! I love peanut butter and honey with fresh berries! I also have an obsession with crepes – you can put just about anything in them! I’ve been on a savory kick lately, so my favorite crepe filling would have to be the combination of sauteed mushrooms and carmelized onions! Anything veggie based. Fresh herbs are a must too!! I love crepes filled with lots of strawberries and a drizzle of honey! I love ricotta and spinach! my favorite filling is fresh ricotta with pear butter. i just got the wondermill grain and can’t wait to use it with your new book! I love matcha pastry cream with ripe banana! Just bought ingredients to make this after reading this post this morning! Thanks for the inspiration. Lovely recipe! Kind of a combination of sweet and savory: gorgonzola blue cheese with pears caramalized in honey and vanilla with roasted walntus and fresh thyme. Bananas and nutella! 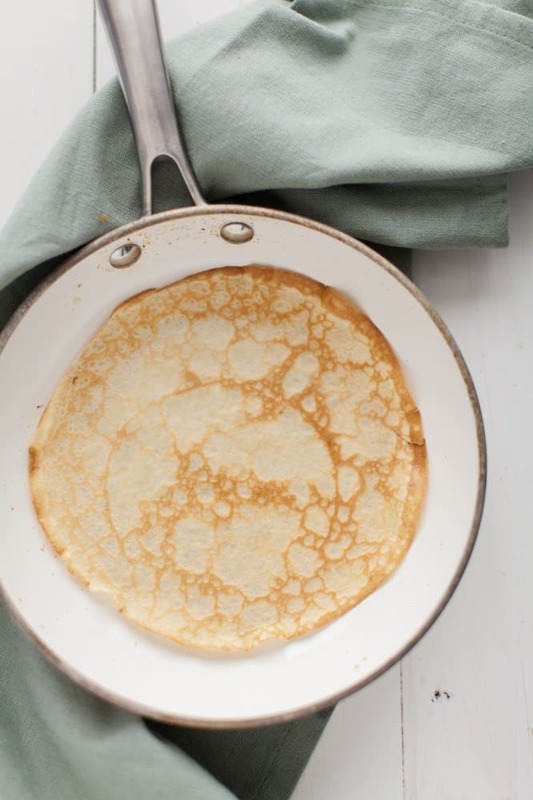 Oat crepes sound delicious! I have to try them! Great giveaway! I live the nuttiness of oats. I love your idea for a savory crepe. I would definitely try it that way. For breakfast, I think it’d be good with a later of almond butter, drizzle of honey, and sliced strawberries. Yum!! I go savory- zucchini and gruyere! Thx for giveaway! I’d use any fruit I have on hand. Right now, strawberries and blueberries. Warmed in a saucepan with a little butter and sweetener and there you have it! Savory: Ricotta, artichoke and freshly ground pepper. Simple! I was very happy to see you on there, I love your recipes and am forever telling people about your site! I did happen to see that 🙂 Thank you Lauren for the kind words! How to decide?? Probably sweet first, since I haven’t made creeps yet and have a sweet tooth lately… Berries? Oh Ella – these crepes look amazing! I’ve printed out the recipe and on my way to find some oat flour! I would have to say that sweet crepes stuffed with greek yogurt and topped with maple syrup and fruit is my favorite! I would love to eat them with tomatos and pesto, yum. Cooked peaches with a little bit of cinnamon. i love savory crepes – caramelized onions mushrooms and thyme. I’d love to try them with za’atar roasted eggplant and onions, with tahini spread and feta! my favorite crepe filling is alwayssss chocolate and strawberries. I would love to fill them with homemade almond butter, or quince and rosemary! I would love to try a jam filling, perhaps for a brunch or light dessert. These look delicious! my fave crepe filling? Goat cheese with green chiles, corn, and diced zucchini. Apple compote or Nutella are my go-to’s! These look so good! I love savory crepes, with veggies…onions, mushrooms, and asparagus sound like it’d be delicious right now! 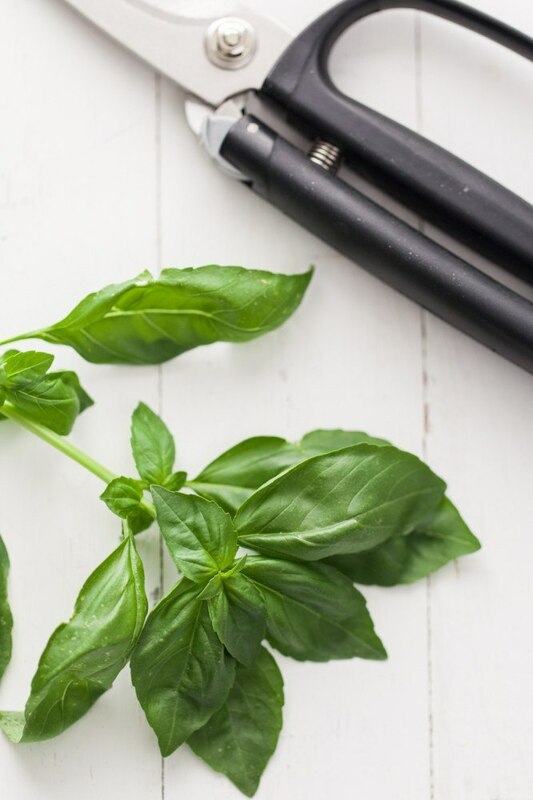 The Tomato, Basil, and Goat Cheese look so yummy in it and all the other suggestions are looking tasty too…I will have to try these soon! I do vegan and savory. Any type of fake cheese will do — cashew, tofu, cauliflower — and some greens sauteed with onion. Your GF recipe looks great and easily made vegan. Thanks! Any kind of cooked fruit! These look so good. I will try them tomorrow for breakfast! I do love a savory crepe, but Nutella wins! yum! We were just in Paris and I was all googly-eyed over all of the crepes there on the street. I would enjoy these with almond butter and jam 🙂 I know that is kind of random but just sounds good to me at the moment! I’ve been looking for a good savory crepes recipe! And so many of my friends are gluten-free. I am so excited to make this. I love the traditional lemon and sugar, but would like to incorporate more savory options to my crepes. These looks so good! I will make this one night. A sauerkraut/carrot/onion filling!! Delicious & nutritious! I’d fill them with pumpkin seed butter. Love all crepes, but there is something about savory ones. Particularly enjoy spinach, mushroom and cheese. Love the crepes! Thanks for the idea! These crepes are amazing! I also made them with spinach in a mixer, and it brougt a little more sweetness to the crepes. Delicious! I have a glutenfree blog and are always happy when I find great gluten free recipes. I would make these for breakfast filling them with scrambled eggs made with green onion, minced garlic, feta cheese, spinach and a few halved grape tomatoes…..mmmmmmm. Used homemade oat flour I had on hand. It gave the crepes a bit of a nutty flavor and added texture to my crepes (since my oat flour wasn’t super fine). Served with almond butter and melted dark chocolate. Great recipe! 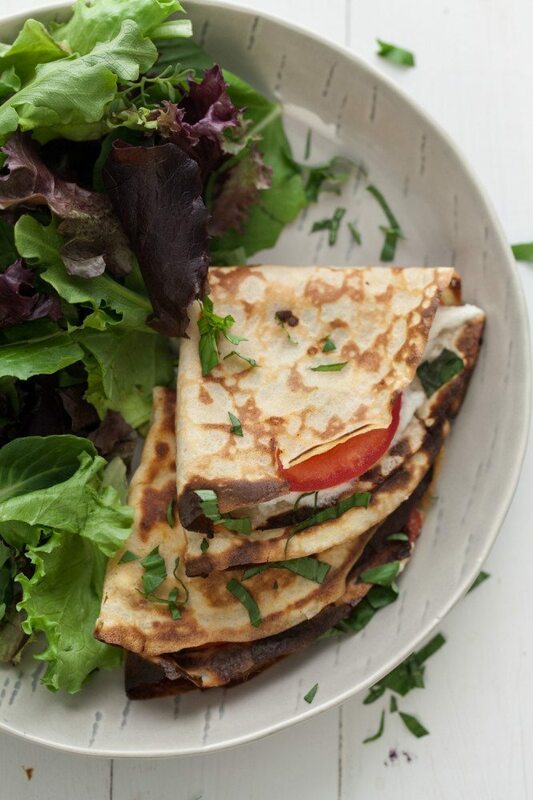 The title says, ‘Gluten Free Oat Crepes with Tomato, Basil, and Goat Cheese’ but then it says cream cheese in the instructions – is it just a typo? BTW – they look delish, I am intrigued. Ah, yes! I just fixed it- it’s goat cheese! 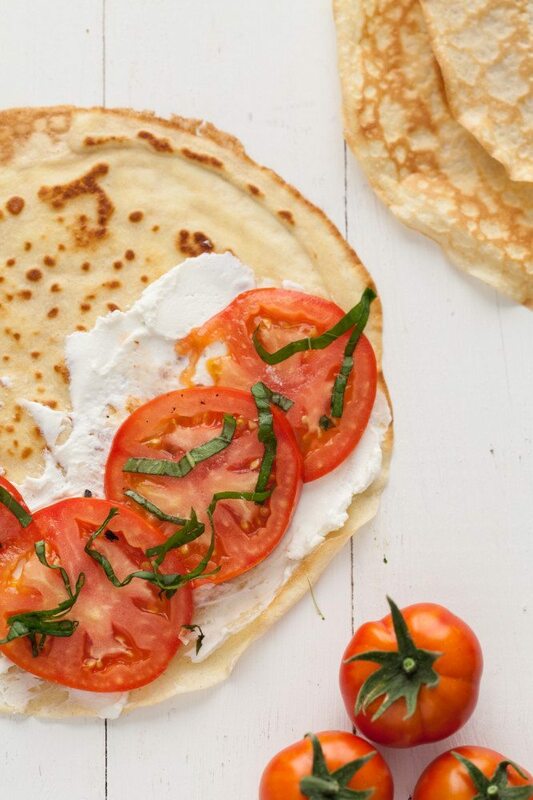 This gluten free oat crepes with tomatoes basil and goat cheese looks absolutely fantastic. Beautiful photos, too. I look forward to trying this. Thx for sharing Erin! These crepes turned out so well. My children loved them with apple Honey cinnamon and cottage cheese. Thank You! 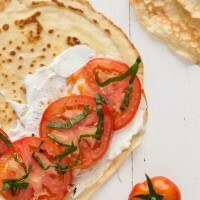 This is so yummy and interesting gluten-free oat crepes with tomatoes basil and goat cheese. I tried this kind of recipe before but this is unique. These crepes look delicious; and after trying out your recipe, I can confirm they taste even better. I like trying out various crepe recipes, being an all time favorite for me. I was curious to see how a gluten free version would taste like; and I am impressed. Hi and thank you so much for sharing this recipe! I just made these for my partner and he loved them!